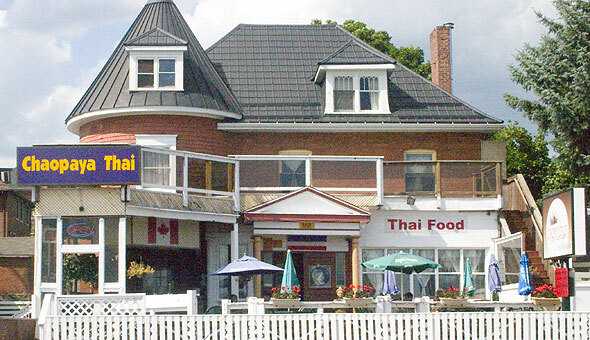 Chaopaya Thai Restaurant is located on Dunlop St. near Poyntz St. in downtown Barrie. They are open seven days a week and have a range of authentic Thai dishes. Chaopaya Thai also offers catering services. Overlooking the breathtaking Kempenfelt Bay, the decade-old patio, Chaopaya Restaurant, is situated strategically at 168 Dunlop St. E., downtown Barrie. Dave Chaopaya, the restaurant’s founding father, expresses the patio’s specialisation on pure, authentic Thai food without fusion with Chinese foods and others. However, this isn’t meant to and therefore doesn’t come out as intimidation to customers, and Dave promises an outstanding experience especially with the recommended Thai spring rolls. They come filled with veggies. Other recommendations which would top the menu are the chicken satay, the gravitating red curry duck without forgetting the rare chicken cashew nuts. You may also like to try some of their fried rice with pineapple, and you’ll surely love the chicken fried rice with basil. Just an introductory suggestion to blow your mind, this is a representation of the whole package spanning to up to over 70 different items. Who’d have known that ten years after its establishment, the Chaopaya Restaurant would be where it is currently. The outstanding patio was and still is the brainchild of Dave Chaopaya, and over the years since its establishment, it’s been able to stand on blocks of uniqueness in the foods they serve and the strategic location of the place, making it one outstanding restaurant in Barrie. What’s so different about Chaopaya Restaurant? Well, perhaps what would make Chaopaya anyone’s go-to is their specialisation in Thai food. Most Thai restaurants usually have some Chinese food accompaniment or a fusion of the two. Chaopaya is no such, and this is what enhances its delivery of delicious foods. The restaurant is also strategically stationed for the enhancement of peace and serenity, and I bet you’d love the view as you relax at your midnight table enjoying the most praised curry! Great View What better way to enjoy a luncheon on a hot afternoon than at Chaopaya with a breathtaking view of the lake! Tranquillity matches the price! Frequenters praise Chaopaya for its tranquil and peaceful environment, and when settling bills which, as per many, are quite reasonable, the pinch of overspending doesn’t cross their minds because of one fact; it’s worth every cent! For its authenticity, it’s therefore reasonable to have one or two who were not happy about something during their visits. Their services could use some improvement. There have been a few noises here and there about the quality of service which needs checking, considering it’s deterring some of the customers impressed by the cooking. The home to Thai food; welcome to Chaopaya Chaopaya is the go-to restaurant, what a place to enjoy a meal at any time of the day!